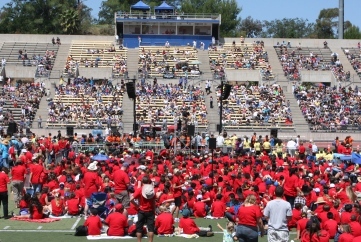 An estimated 11,000 Santa Clarita Valley sixth- and seventh-graders, local educators, business people, dignitaries and residents converged on College of the Canyons’ Cougar Stadium Friday morning, in an apparently successful attempt to set a new Guinness World Record for the largest percussion ensemble. 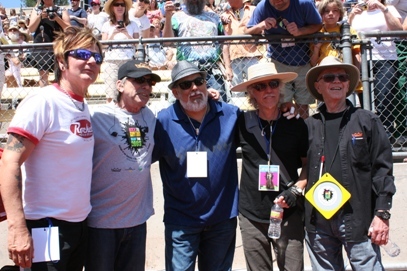 Rock ‘n’ Roll Hall of Fame drummers Mickey Hart (The Grateful Dead, The Other Ones, the Mickey Hart Band) and John Densmore (The Doors), along with Grammy-winner Poncho Sanchez, Rikki Rockett (Poison, and a Santa Clarita resident), Gordon Campbell (George Duke, Mary J. Blige), Eric Hernandez (Bruno Mars) and Mike Phillips (Janelle Monae) were among the celebrities on hand to help lead the attempt, which called for all hands playing their Remo “sound shape” percussion devices continuously for five minutes. More than 7,500 students with sound shapes were on the stadium field, seated in sections designated for each school, and wearing colorful “Rock the Rhythm, Beat the Odds” commemorative T-shirts imprinted with their school’s name. Braving the bright sunshine and temperatures in the upper 70s, the students followed the “BOOM-a-bump-a-BOOM-BOOM-BOOM” rhythm set down by Hart, who directed the huge ensemble from a riser on a stage set up in front of the home spectator stands, where another 3,500-4,000 local residents joined in the jam. Delivered from their respective schools by a fleet of buses, the students represented five local school districts — Castaic Union, Newhall, Saugus Union, Sulphur Springs and Wm. S. Hart. After percussing for the five minutes, the students, artists and organizers were elated. According to the Guinness website, the current record for largest percussion ensemble (not drum circle) is 10,102, set in Hong Kong in 2002. Friday’s world record attempt at COC was the culminating event in the “Rock the Rhythm, Beat the Odds” music in education program taught to local sixth- and seventh-graders during the past school year by the COC Performing Arts Center’s K-12 Arts Education Outreach Program, in association with the city of Santa Clarita and local drum/percussion instrument manufacturer and rhythm educator Remo Inc. 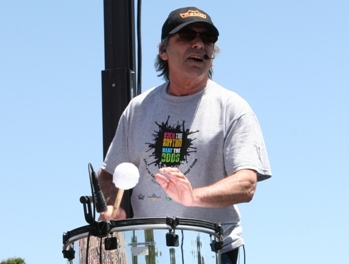 The Valencia-based company’s founder and CEO, Remo Belli, is a major proponent of “Beat the Odds” and music in education, and donated all the sound shapes for the event. 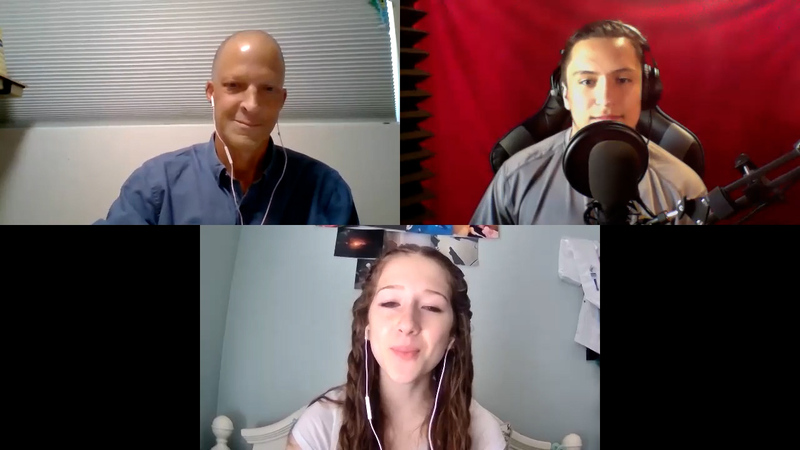 “Rock the Rhythm, Beat the Odds” is a hybrid music and rhythm course that emphasizes the process of learning over performance. The program integrates activities from contemporary drum circles and group counseling to teach skills in focusing and listening, team building, positive risk taking, self-esteem, awareness of others, leadership, expressing feelings, managing anger/stress, empathy and gratitude. The world record attempt was also designed to boost public awareness of how important the arts and especially music are in the development of a well-rounded child, and to encourage creative solutions to budget crises that have gutted arts and music education in schools in recent years. After the event, as the students headed back to their buses, a number of the artists hung out with the large crew from Remo in the stadium’s Cougar Den and spoke with reporters. 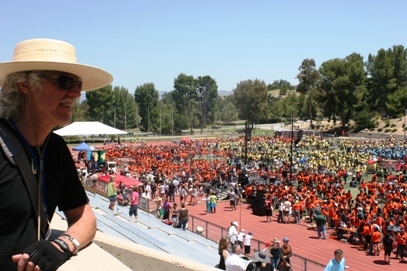 From the home-side stands, John Densmore surveys the approximately 7,500 Santa Clarita Valley students gathered on the Cougar Stadium field. 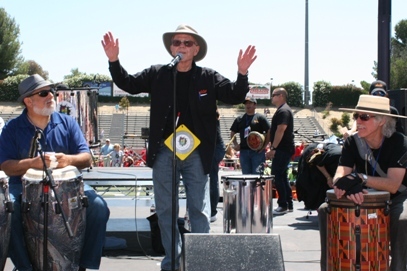 Remo Belli displays one of the 11,000 sound shapes his company provided for the world record attempt. Read the preview stories below for more background on “Rock the Rhythm, Beat the Odds” and Friday’s world record attempt, and check this story later for more photos from the event. And for even more information about the “Beat the Odds” outreach program and the “Rock the Rhythm, Beat the Odds” world record attempt, visit www.rocktherhythm.org. Find out more about the PAC’s K-12 Arts Education Outreach Program at www.canyons.edu/Offices/PIO/CanyonsPAC/k12arts.html. My son was there. HATED it. He said he regretted going and would have preferred to stay at school.